Evening clouds will give way to clearing overnight. Slight chance of a rain shower. Low 41F. Winds WNW at 10 to 15 mph..
Evening clouds will give way to clearing overnight. Slight chance of a rain shower. Low 41F. Winds WNW at 10 to 15 mph. Heidi and Patrick Bonito Jr.
A local scouting group was among the first to have a whole groups worth of girls join an organization that decided to go co-ed in 2018. Rockmart’s scout hut made history on Feb. 1 when they held their first Scouts BSA meeting to include an all new girls troop. “They are among the first in the nation that will now have the opportunity to advance through this program toward the highest rank of Eagle Scout,” local scout Nathan Bonito reported in a press release last week. 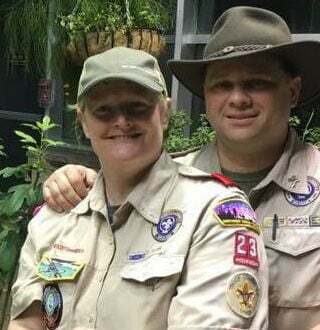 Bonito’s parents, Heidi and Patrick Bonito Jr., provide the space for Troop 23 at the Rockmart Scout Hut and also act as scout leaders. Heidi Bonito said in a follow-up on the historic news that Rockmart’s group was only beat out by Guam in getting in the first all-female group. “They only beat us by hours!” Bonito said. They did however become the first all female group to have enough members for a single group in Northwest Georgia. They include Brianna Garrison, Grace Rayson, Samantha Stern, Rylee Parker, Rachel Morton, and Maddison Williams. “We’re pretty excited that Polk County alone has enough young ladies interested to fill a group,” she added. It marks a new era in the long history of Troop 23 that spans back to 1934. The Bonito family continue to be both as hosts and leaders of the troop since 2010. The Scout Hut now currently runs 4 successful individual scouting programs. The programs include the brand new Scouts BSA Girls Troop 23 ages 11-17, a traditional Boy Scouts of America Historic Boys Troop 23 ages 11-17, a traditional Girl Scouts of the USA program grades K-3rd and a co-ed Venturing Crew 23 Program ages 14-20. “These various programs not only offer leadership training and character building opportunities, but also fun, fellowship and adventure,” he said. They attribute the high success of these 4 different scouting programs to all the current volunteer leaders that have genuinely been involved in taking pride in running core valued programs with faith, honesty, integrity, citizenship and heritage. The Rockmart Scout Hut is located at 110 Catherine Court. Anyone interested in more information please contact rockmartscouting@gmail.com.